Creative Customization – Door Control, Inc.
Automatic doors and operators can be surprisingly versatile. We have been fortunate in collaborating with some brilliant minds on creative, custom projects. Such as an application in an amusement park. Or in a space museum. Or a performing arts theater. Are you thinking of something creative? We have experts with the perfect balance of creative thinking and technical design. Let’s talk about your project – with a no cost consultation. 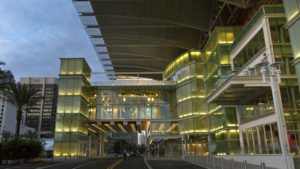 Dr. Phillips Performing Arts Center, located in Orlando, Florida, is a unique and innovative design that offers an overwhelming center for the city, even the nation. Designed by the award-winning, Los Angeles architect firm Barton Myers & Associates, this facility integrates modern amenities while promoting interaction and participation. DCI’s role was on the high profile main entry wall. We mounted overhead swing operators on a moveable wall so the entire wall slides open. In addition, we placed in-ground operators into the floors in order to safely and smoothly open and close the all-glass back wall. View the fly-through video here. At the Polytechnic University of Florida, you may have noticed the newest campus addition; the Innovation, Science and Technology building. 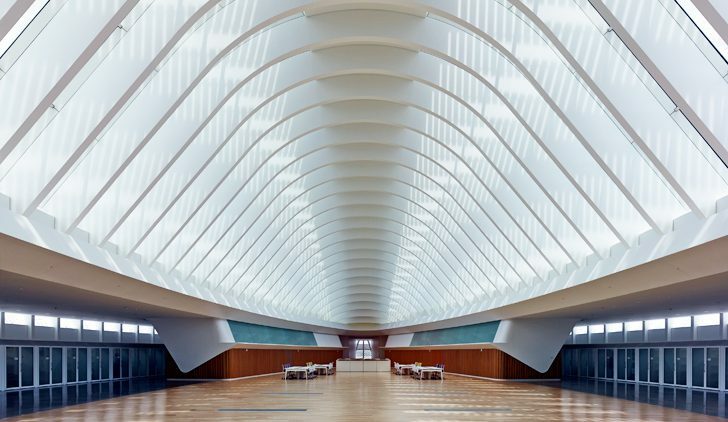 The hard-to-miss highlight of this building is the futuristic, ceiling that resembles the shape of a massive glass ‘egg’. The pergola is made up of 46 aluminum louvers. DCI’s role was to make this eye-catching attraction into a robotic, operable roof. So we buried the operators in the ceiling. Concealing the hardware provided the functionality for the roof to operate while still allowing for a clean, appealing look. Also incorporated into the roof is a sunshade running the length of the entire roof. It moves across the building, following the sun’s path across the horizon throughout each day cycle. * DCI has the dream team by combining our creativity with experience and knowledge. We understand how wind speeds, temperatures, aesthetics and other factors can affect projects.